Blueberries are best known for their high content of flavonoids and other phenolic compounds which provide health benefits. 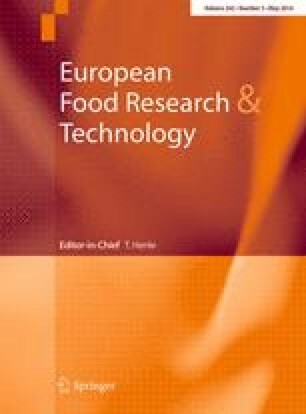 The objective of this study was to investigate the effect of microwave, pressurized solvent, and supercritical carbon dioxide (SC-CO2) extraction techniques on the anthocyanin content of the water extracts obtained from dry whole blueberries. Effect of the blueberry extracts on selected cancer cell lines was also investigated. Neat and ethanol entrained SC-CO2 extracts did not contain detectable amount of anthocyanin. Microwave power did not have a significant effect on anthocyanin recovery. The blueberry juice (BJ) prepared by homogenization of fresh berries followed by microfiltration had the highest anthocyanin content among the extracts examined in this study. However, the blueberry water extracts prepared using other extraction techniques had a higher total phenolic content than the BJ. The effect of the blueberry extracts on the cancer cell lines was dose-dependent and varied with the cell type and the composition of the extract. BJ had a similar IC50 to the commercial cancer treatment drug doxorubicin for the cancer cell line MCF7. Further research is needed to elucidate the mechanism underlying the effect of blueberry extract composition on the viability of different cancer lines. We would like to thank The Scientific and Technological Research Council of Turkey (TUBITAK), Sabbatical Leave Program, for the funding provided to N.T. Dunford.